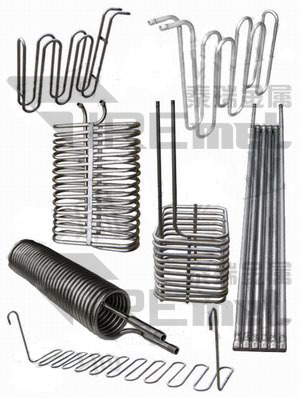 Titanium Heating Coil and Titanium Cooling Coil are made out of titanium pipes or tubes with dia 8mm-65mm as per ASTM B 337/338,Gr1 or Gr2,applied to chemical,electroplating and metal finishing industries to heat or cool the chemical bath. We also manufacture the coils in special sizes and shapes,like superfine U coils, spiral coil,box type coil,drum type coil,'S'type coils,tapered, oval type coil,circular coils,serpentine coil,double helical coil,triple helical coil,half pipe coils. We can also produce zirconium spiral pipe.